Supported by the British Council Sri Lanka, Ackroyd & Harvey created three new works for the group exhibition that took place in the former Colombo terminus railway station in Maradana. For Re/Evolution Ackroyd & Harvey are adapting their photographic photosynthesis process to work with locally sourced seeds, such as rice and millet. 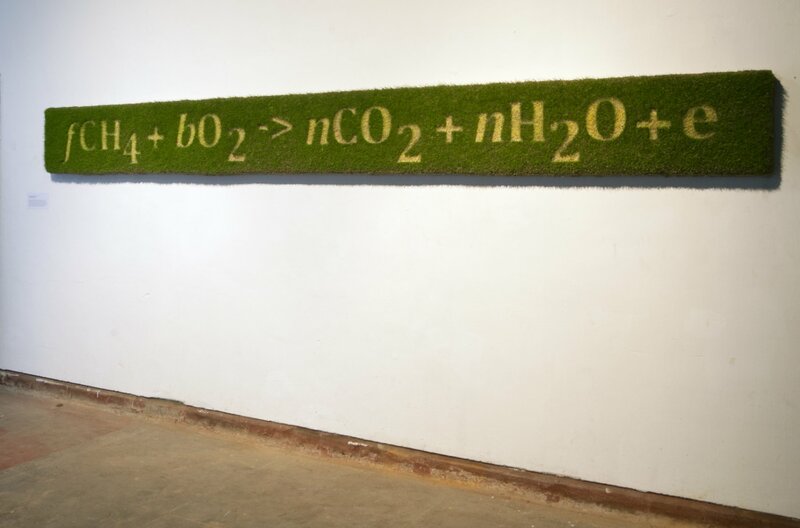 The artists regard the experimental nature of this work as intrinsic to their approach with working with living plant material. Equally, the subject matter of their living photographs is not pre-determined but arises in response to their arrival on site through encounters with place and people, shaped by their long-term concern with environmental degradation and socially engaged artistic practice. 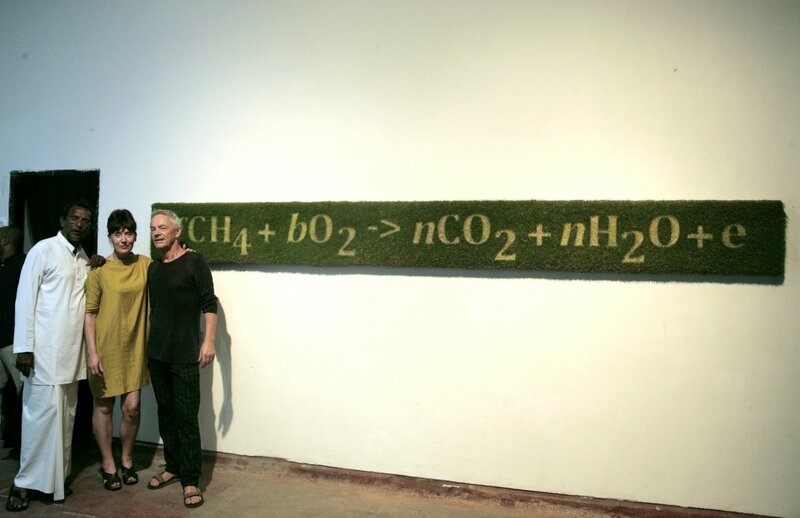 Here in Colombo, Ranil Senanayake, Doctor in Systems Ecology and pioneer of Analog Forestry is the subject of their artwork; a large-scale portrait of Senanayake is grown in chlorophyll and a stencil piece recreates his recently published Satanic Formula in living plant material. 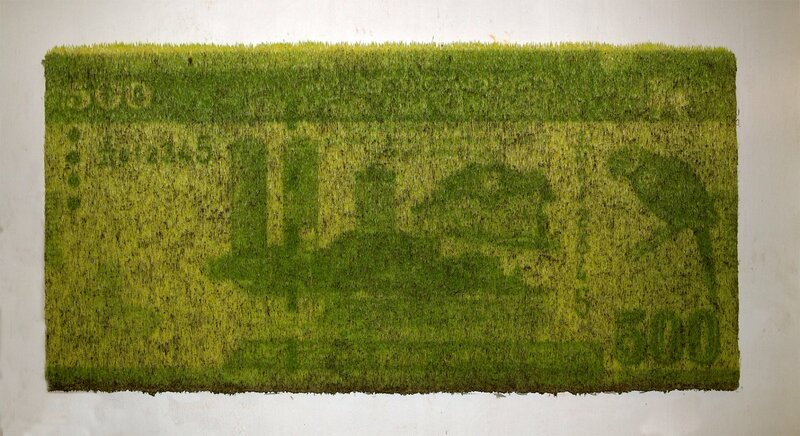 A third artwork, a photosynthesis photograph of a 500 rupee banknote, presents the idea of money growing through value ultimately being placed on the life-affirming role of photosynthetic plants. 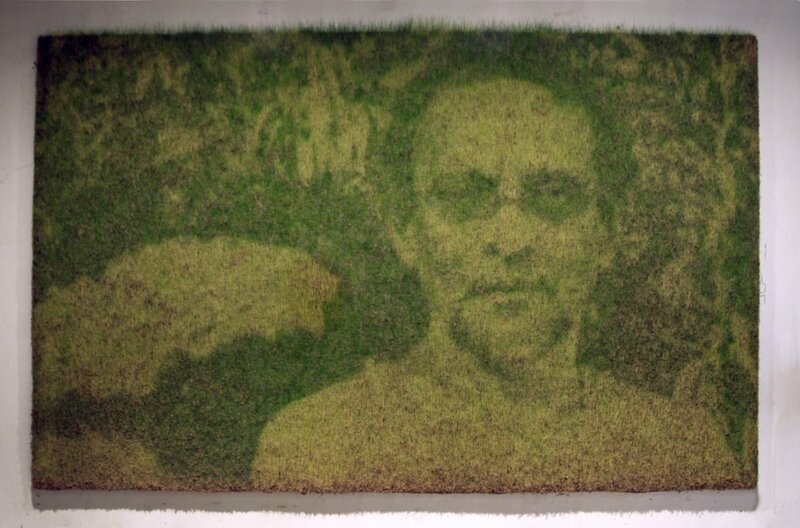 Ranil Senanayake, Doctor in Systems Ecology and pioneer of Analog Forestry is the subject of the artwork; a large-scale portrait of Senanayake is grown in chlorophyll through the process of photographic photosynthesis using rice and red millet. A photosynthesis photograph of a 500 rupee banknote, presents the idea of money growing through value ultimately being placed on the life-affirming role of photosynthetic plants; the profit to humanity and multi-species is to invest in massive re-vegetation programs to ensure restoration of the critical supply of oxygen in protecting human life and industry, and hence replenish the web of life and richness of bio-diversity. Image created in chlorophyll through the process of photographic photosynthesis using red millet.